Is your Power Wheels Battery dying too quickly, not charging, cracked or missing? You may need a new Power Wheels 12VDC Gray Battery 00801-0638. This battery is original equipment and provides the long-running performance you've come to expect from Power Wheels parts. 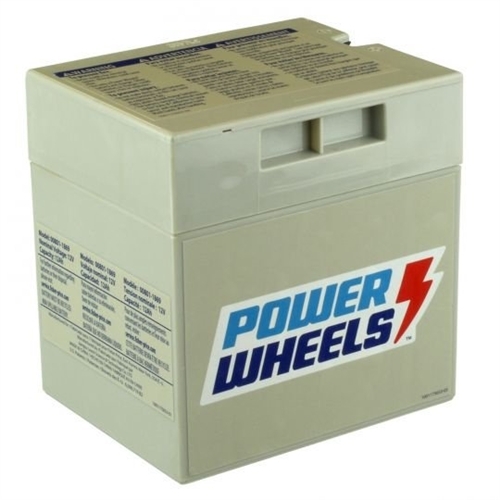 Use this 12 volt battery to restore top performance and charging reliability to your child's Power Wheels ride-on toy. This battery fits many vehicles and should be stored indoors to ensure optimum performance and lifespan. OEM part numbers: 00801-0638, 00801-1460. •Fisher-Price Power Wheels Advanced Series vehicle Models 73530 Lightning • 73535 Minibike • B2222 Minibike • B9272 Kawasaki KFX • B9273 Kawasaki KFX • B9784 Girl's Harley Restage • B9785 Kawasaki Adventure 4x4 w/Trailer Canada • B9820 Kawasaki Adv enture 4x4 w/Trailer Canada • BBF03 Hot Wheels Jeep • BBF04 Barbie Jammin Jeep • C0530 Rally Kart • C0532 Racer Kart • C2390 Jeep Wrangler • C7478 Kawasaki • G3740 Street Scene Silverado • G4647 Minibike • G4882 Minibike • G5107 Lightning • H0128 City Slammin' Silverado • H0150 Volkswagen Dune New Beetle • H0436 Gravedigger • H0438 Cadillac Escalade • H0440 Escalade • H0638 Classic Chrome Harley • H2836 Driveway Racer • H3427 Barbie Jammin' Jeep • H4433 Barbie Beach Party Jeep Wrangler (after 3-12-07) • H4433 Barbie Beach Party Jeep Wrangler (before 3-12-07) • H4803 Blue Jeep Wrangler • H4804 Blue Jeep Wrangler Canada • H4805 Jeep Wrangler. • H4807 Jeep Wrangler • H4808_Classic_Chrome_Harley • H7332 Dora Quad • H8256 Lightning McQueen • H9800 Kawasaki KFX Ninja Extreme • J4390 Mustang (Red) • J5246 Barbie Cadillac Escalade • J5248 Kawasaki Brute Force • J8472 Kawasaki KFX Ninja • J9561 Mustang-Blue TRU • J9562 Mustang-Pearl TRU • K0450 Kawasaki KFX Blue • H4435 Dora Jeep Wrangler • K8285 Ford F-150 • K9758-Diego_Jeep_Wrangler • L2170 Arctic CAT • L6345 Nascar Dale Earnhardt Jr • L6348 Ford F-150 TRU • L6349 Barbie Mustang • L7820 Barbie Jammin Jeep Refresh • L7821 Nascar Jimmie Johnson • L7822 Nascar Jeff Gordon • L7823 Nascar Tony Stewart • L7824 Cadillac Escalade Refresh • L7825 Arctic CAT Camo • M0409 Cadillac Escalade Barbie Refresh • M0410 Cadillac Escalade TRU Refresh • M0412 Harley Cruiser • M7873 AT REX • M9779 Ford F-150 Craftsman • M9780 Escalade Hybrid • N0457 AT REX • N1475 Barbie Escalade • N1476 Jeep Rubicon • N3089 Jeep Rubicon • N8417 Escalade • N9522 Escalade • N9731 Kawasaki Brute Force • P4266 Stinger • P5065 Harley Rocker • P5066 Barbie KFX • P5920 Boys Mustang Restage • P6827 Girls Mustang • P8013 Barbie KFX • P8195 Boys Mustang • P8812 Barbie Mustang • P8814 Arctic CAT Red RFSH TRU • P9723 Red KFX • R3142 Red KFX • R8126 Brute Force • R8548 Brute Force Camo (Bass Pro) • T4871 Barbie Jammin Jeep Refresh • T4872 Target Red KFX • T6137 - Dora 10th Jeep Wrangler • T6138 Tough Talking Jeep • T6991 Ford F-150 • T8396 Barbie Jammin Jeep • T8786 Ford F-150 • V2503 Barbie Jammin Jeep • W0029 Ford F150 • W0030 Ford F150 • W1070 Ford F150 Raptor • W1652 Barbie Jammin Jeep with Bounus Barbie • W1866 Barbie Jammin Jeep • W2602 Dune Racer • W4473 Barbie Jammin Jeep • W4715 Barbie KFX • W4716 Hot Wheels KFX • W5540 KFX • W6201 HW Dune Racer • W6203 Barbie Escalade • W6204 HW Dune Racer • W6205 Barbie Escalade • W9257 Boss Mustang • W9417 Cadillac Escalade-Boys • W9418 Hot Wheels Jeep • X3418 Barbie Jammin Jeep • X3419 Purple Escalade • X6833 Hot Wheels Jeep Walmart • Y6533 Dune Racer WMT • Y8208 Orange Boss Mustang • Y8638 Hot Wheels Jeep • Y9367 Barbie Dune Racer.